Epic. Awesome. Classic. Wow. Whatever your favorite exclamation word is — this weekend was it! The criterium Saturday night had the feel of Athens Twilight with a fast course, lots of people lining the course, and a huge field. I ended up in OK position (top 20) for the start of the last lap, but got stuck behind a crash with three turns to go. After coming to a complete stop, I went around the crash and ended up 27th. Meanwhile, Team Predator Carbon Repair swept the podium. The road race was the highlight of the weekend for me, though, with a downtown circuit on a closed course (rolling enclosure) that featured a steep 16% climb towards the end of each lap and two separate 50mph descents. I rode conservatively, so I survived the race – but I also missed the key move. In fact, I watched it go away thinking that it was still too early (about halfway through the race). The move stuck, and a few laps later I ended up in a five-man chase group. We worked well together and stayed away from the field, but I was fighting off cramps and ended up last in the chase group for 14th in the race. Daniel Patten (Mountain Khakis/Smart Stop) attacked the break and ended up winning solo. Chris Uberti (Mountain Khakis/Smart Stop) also got away and soloed in for second. You can tell from the data that the course was about 0.9 miles long and laps were a bit under 2 minutes long. The start/finish stretch was straight with a very gradual downhill into turn 1. This led into a slight rise all the way through Turn 2, which was a brick covered turn — no issues since it wasn’t raining but would be a bit tricky in the rain. You continued climbing out of Turn 2 until you crested the hill right in front of the Mariott (race hotel). The road dipped down sharply (about 8%), and we hit about 40mph every lap. There was a bit of a flat run-out before Turn 3, but you still had a lot of momentum, which you wanted to carry through Turn 3 because this was straight back uphill to the high point on the course. Turn 4 should have been a fast turn, but it seemed like we always bunched up there. Turn 5 was a right turn, followed very quickly by a left and 100 meters left to the start/finish line. Perhaps the biggest surprise of this race for me was how high my heartrate was. I’ve known that my threshold heartrate is about 180, but I’ve always kept my Zone 5 starting at a heartrate of 175. In this race, I averaged 180 for well over 1 hour, 15 minutes so I’m guessing my threshold heartrate might even be a beat or two above 180. The problem with changing my HR zones at this point in my life is that it makes it impossible to do an apples-to-apples comparison of time spent in heartrate zones from all my previous years. I guess I’ll just leave it as is. Anybody have thoughts on this? You can tell from the lap data above that the road race course was around 7.2 miles long. 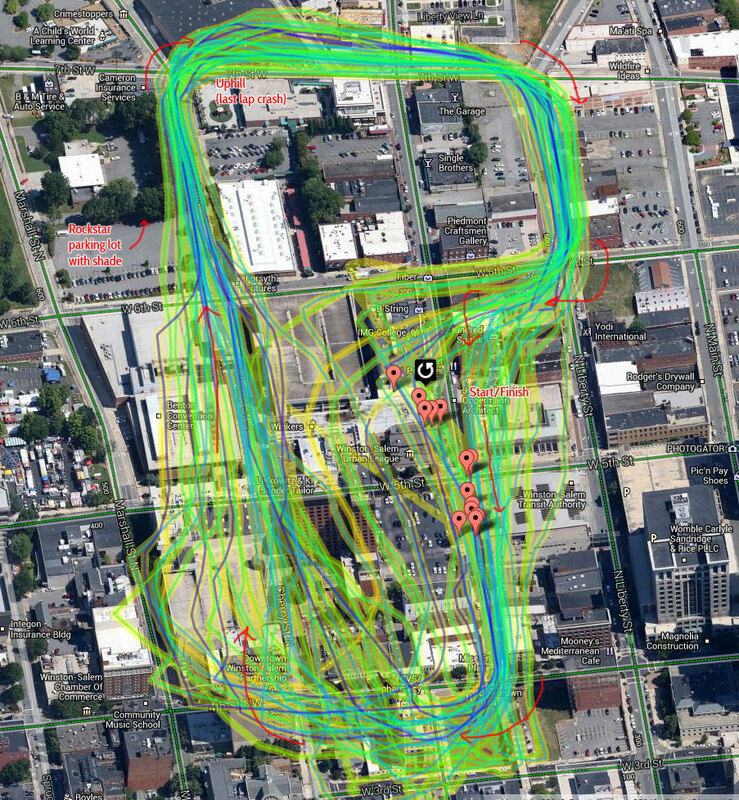 The primary feature of the course was the fact that it went through so much of downtown Winston-Salem on a closed circuit (rolling enclosure). This was a hard race, but it was definitely one of the best courses I’ve raced this year. It was also quite hilly — with a steep 16% climb out of Hanes Park less than a mile from the finish. Given how hot, long, and hard the road race course was I tried to be really conservative so you can see my heartrate data is much lower. You can also see why so many people didn’t finish the race — look how hard we started out before the times slipped down into something more reasonable. Kristine and I wanted to bring the kids, but their weekend was already full (Josiah was fishing with some friends) and Analise had something going on at church. So it was just me and Kristine making the 7.5 hour drive from Birmingham Saturday morning arriving about 3 hours before the start of the race. This gave me some time to warm up and explore Winston-Salem. I found some cool roads and some sort of boarding school (appeared to be closed for the summer) with a dirt road back to a farm. 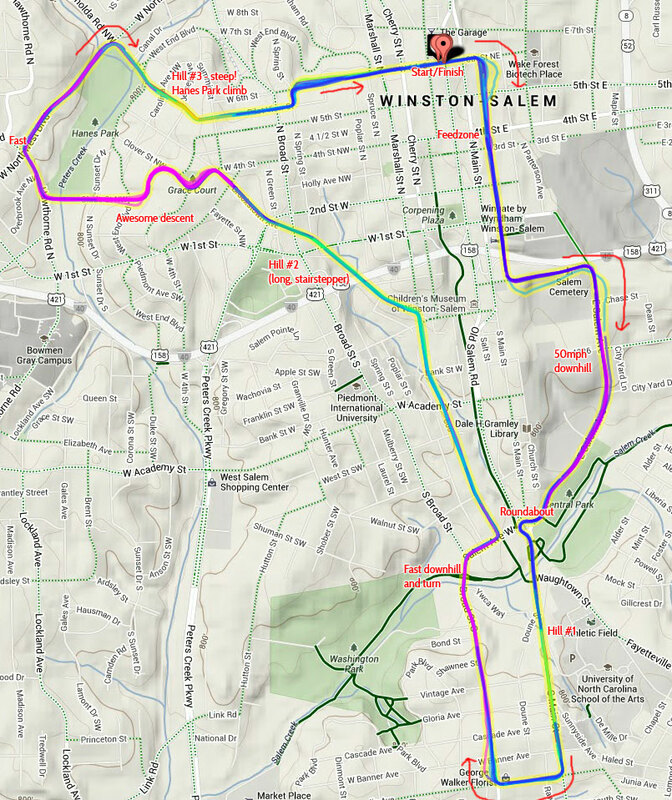 I also saw a few urban trails (you can also see on the road race map how many dedicated trails there are in Winston-Salem – the solid green lines). It wasn’t enough time to explore all the roads, though, and I’m already seriously thinking about an excuse to get back up there and ride some more! I rolled back towards the course just in time to see Allison Powers take the crit win. I had already ridden the course a few times before the start of the women’s race, but I decided to spin around one more time before the start of our race. I think we ended up getting in a couple laps before people started to line up. I lucked out a bit because right as I finished a lap, they brought out the ribbon to block off our staging area. Almost instantly, there were more than 100 riders lined up behind it because everybody knew how difficult this course was going to be. The start was fast, and the rider in front of me was unable to clip into his pedals. I ended up losing a bunch of positions immediately because of this and then continued to lose positions throughout the next few laps. I tend to start out way too conservatively. But it only took a couple laps to realize that it was time to either “move up” or “get gapped off”. I switched into Athens Twilight mode and made it my primary objective to pass riders wherever I could anywhere on the course. Still, it was tough to move around because the course was so fast. I never once made it to the very front of the race. It was a bit disheartening at the top of the backside downhill to work so hard passing people and then still see so many riders stretched out in front of you. By the end of the race, though, I had moved all the way up to 19th (according to the chip timing) at the start of the last lap. A gap opened up in front of the rider in front of me at the top of the downhill, but I was able to hop on the wheel of a rider who came around from behind me. A third rider passed us both going into the last corner which turned out to be good for both me and the rider I was following because we could see him slam on his brakes to avoid people who had fallen just out of sight around the corner. I came to a complete stop, hunched over expecting people from behind to come plowing into me — but apparently there was a big enough gap that had opened up behind us that the other riders were able to slow down and pass us on the inside without stopping. Unfortunately, it must have been about 12 or 13 people that made it around because I passed about 5 or 6 people after restarting and still ended up 27th having lost a net of 8 places on the final lap. Unfortunate ending to what otherwise was a great race. That’s the nature and excitement of crit racing – I could have just as easily been a couple riders farther back and been able to take advantage of the crash to move up a bunch of spots. Or I could have been a couple riders farther forward and gone down in the crash. One of the riders was hurt pretty bad and taken to the hospital. Does anyone have an update on him? We stayed at the race hotel — the downtown Mariott — and didn’t even have to move our car from the lot we were in. The hotel was awesome, and our room overlooked the start/finish for the Sunday road race. In fact, we were able to watch the women’s field roll out and come in for the finish of their first lap before checking out. Our race was scheduled to start as soon as the women finished, but the police needed to have a break (understandable considering how hot it was and how much work they were doing). So our race ended up starting about 30 minutes late, and we went through two separate scrums for the line. I ended up in great position for both of them, but again started out too conservatively and lost a ton of positions in the first half lap of the course. By the time we hit the Hanes Park climb at the end of the course, I was probably 100 riders back from the front. Gaps were opening up ahead of me, but fortunately there were enough motivated people to chase back onto the group. During this time, a large break of maybe 10 or more riders escaped. I thought they were gone for good — especially when a secondary chase group of almost 10 riders formed. But there were a number of strong people left in the field (including me) who had missed the move and tried to get across. This happened enough times that we eventually brought the large 20 rider break back by about 30 miles into the race (the two groups had merged). This shocked me somewhat as I thought the race was pretty much over. The merged field probably had less than 75 riders at this point, and the counterattacks that went eventually led to a break of 11. I still wasn’t in good position and found myself at one point as the very last rider in the field. I know this because I got squeezed out of one of the turns and had to take the long way around finding myself getting passed by the trailing motorcycle and having to catch back on. Each lap our field got smaller as people came off on the final climb and weren’t able to catch back onto the field as it flew through the start/finish, made a turn, and hit a head/sidewind through the feedzone. With a few laps to go, there was maybe 20 of us left in the field. Andy Scarano (UHC/706) attacked and got away eventually joining his teammate Winston David who I believe was coming back from the break. I attacked up the first hill from what was left of the field, and Gavriel Epstein (Champion Systems) bridged up to me. The two of us bridged up to the UHC duo, and then the four of us eventually caught Curtis Winsor (Smartstop / Mountain Khakis) who was either coming off the break or had attacked earlier. We worked well together, but still had a two plus minute gap to the break. With two laps to go, we were told that this would be our last lap. The police were ready for us to be off the course, and it didn’t seem realistic for us to catch the break. I had mixed feelings about it because I was fighting off cramps and ready to be done, but I was also still holding out hope we would catch some guys from the break which had dwindled down to 9 riders. With only one lap to go, though, our chase lost cohesion as we started to attack each other. Eventually Winston got away and stayed away for 10th. Then on the final hill, Gavriel attacked and got away taking 11th. Then in the final sprint between me, Andy, and Curtis — well let’s just say I finished 14th in the race — you do the math. Less than 30 finishers out of close to 150 starters. What an epic race! This entry was posted in Racing and tagged criterium, downtown, epic, hot, race, road race on June 18, 2013 by kartoone.